I’m feeling a little proud of me. 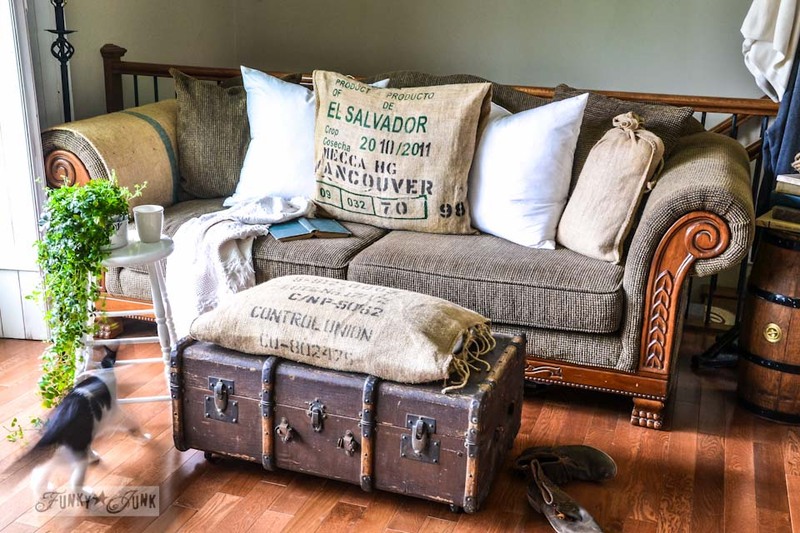 We finally ditched the granny styled ottoman we’ve had for several years, and created a funky old trunk and bean sack ottoman that is much more… funky! And this creation couldn’t have been simpler. It’s rustic in all the right places. And fits right in with the hydrangea filled fireplace mantel and the cabinets on the wall. This livingroom is finally making some cool headway! 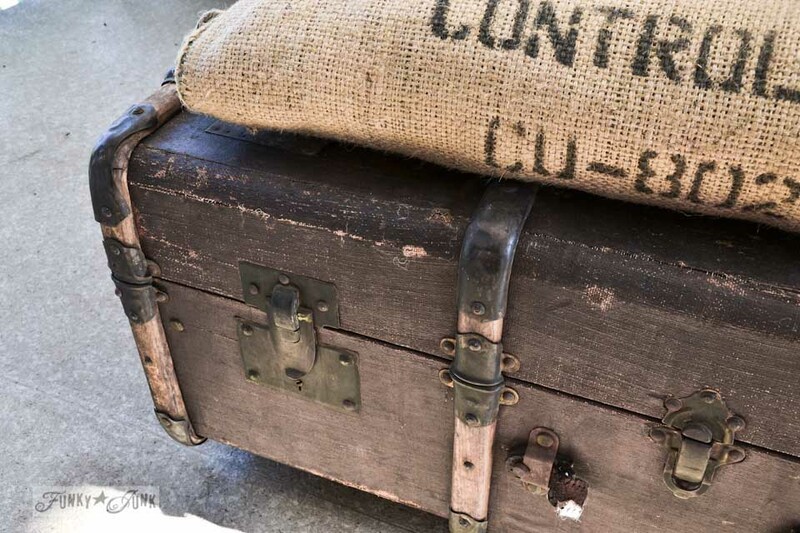 This cool old relic of a trunk was scooped up from Granny and Grumpa’s not that long ago. And I had been using the trunk as a coffee table on the patio. But with fall approaching, I wanted it to work inside instead. No rest for cool junk in these parts! Four small chunks of 2×4’s and 4 caster wheels is all you need. And screws. And a cordless drill. And some trial and error because I messed up a few times figuring this out so you don’t have to. 1. Screw a chunk of wood into all four corners INSIDE the trunk. One screw for now because these won’t be staying. The board by the drill went underneath the trunk so I didn’t screw the works into the patio floor. I did not mess up there! 2. Flip the trunk over, and screw on the blocks of wood from the outside. Then remove the interior screw. 3. 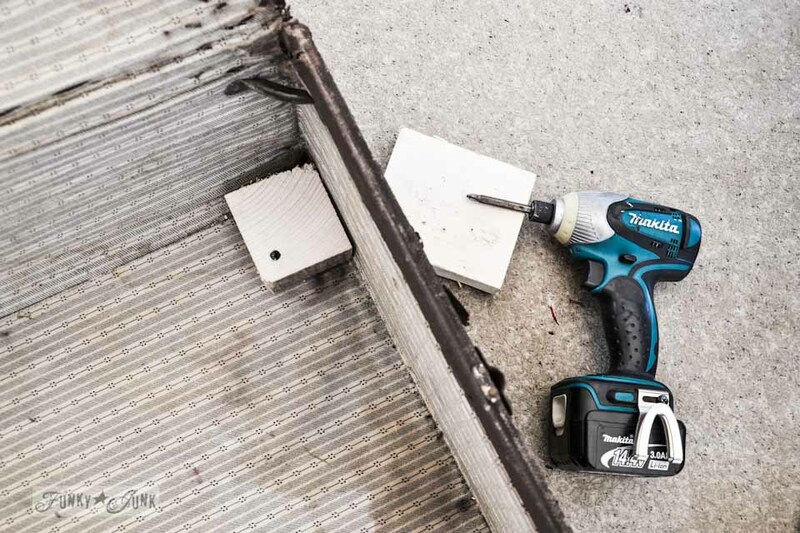 Drill a hole from the outside into the block of wood inside. This is for the wheel arm. See that screw sticking out? That’s why you need to remove the interior screw. 4. Repeat with all four wheels. By golly it worked! You now have a trunk on wheels! 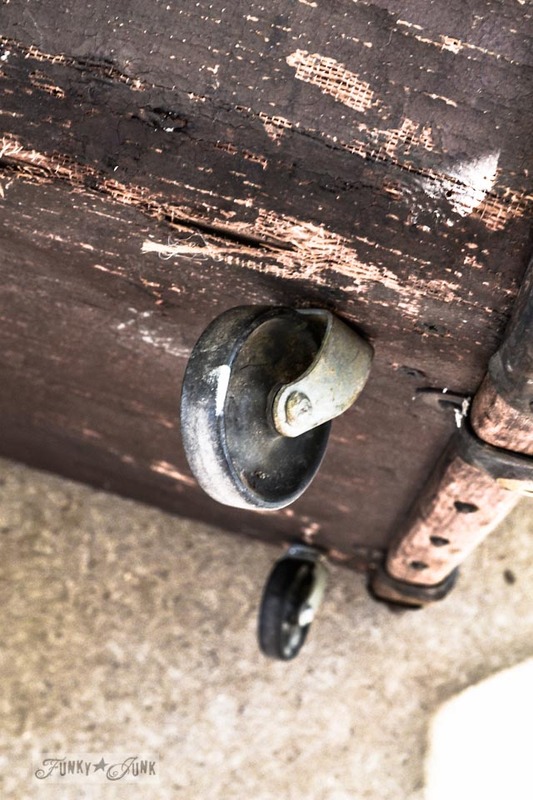 Update: How and why I updated the casters to new ball bearing ones is in THIS POST. I just made this method up because it seemed somewhat logical. If there’s a better way to do this, chime in because I’d love to know how! 1. 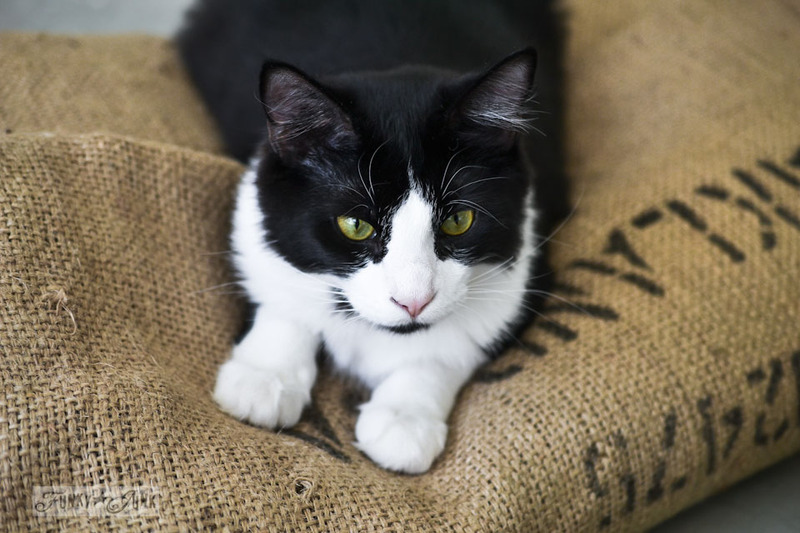 Find a coffee bean sack you love, and a pillow you can do without. Tip: A pillow that puffs up easily is best so it doesn’t always look squished. 2. 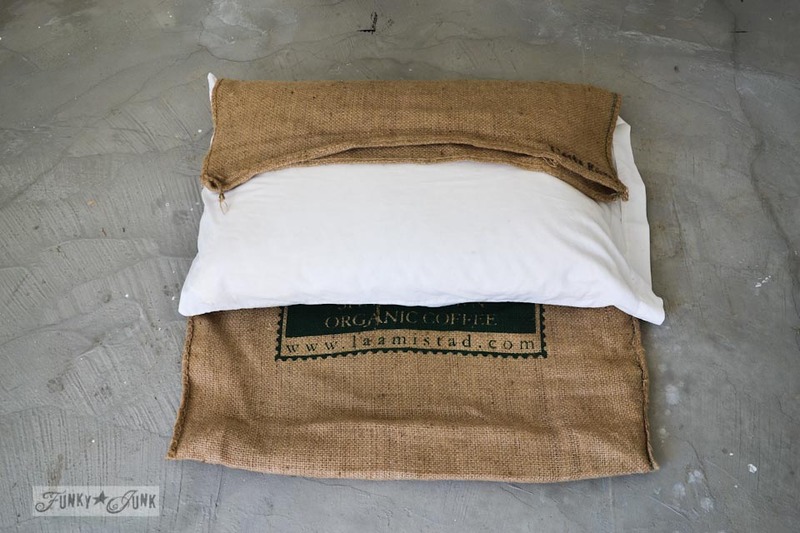 Wrap the pillow with the sack on one side, then the other, until the pillow is completely covered. 3. Put kittens to work, holding the folds down until you can attach snaps and ties. Good girl! 4. 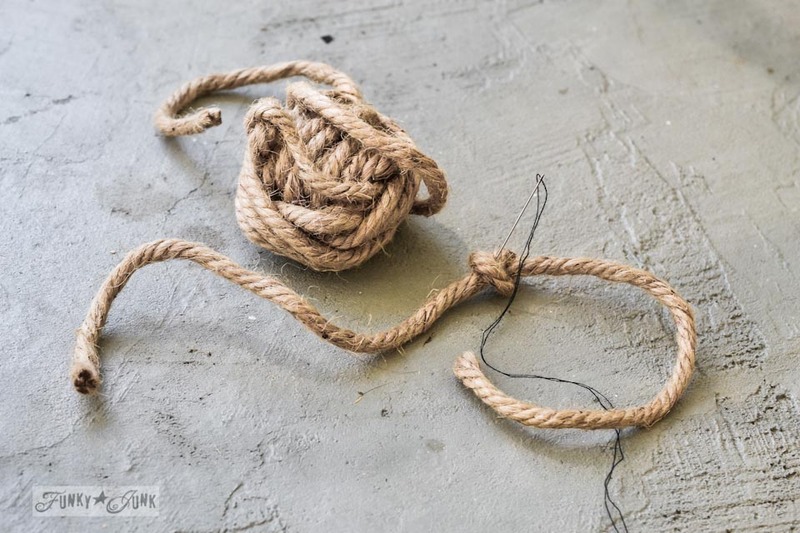 Create rustic ties with heavy twine. You’ll need 6 per each side of pillow. 5. Tie a knot in the centre of each. 6. 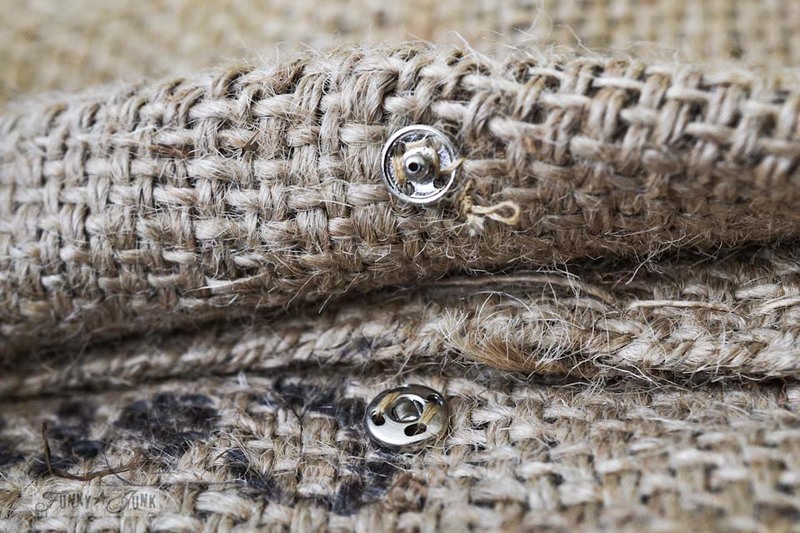 Hand stitch the knots onto the sack edges, 3 along the top and 3 along the bottom, and position so they can tie together from above and below. The ties will make messy but funky cool looking knots! 7. Hand stitch snaps along the folded area. And your pillowcase is complete! 8. Be amazed that I found a needle and thread in this house. It was no small feat. And I silently whined the entire time I did the stitching. I’m sure that didn’t help one bit but it is what it is. Sewing is a slllooowww methodical process and I’d rather pound in a nail and hang something up QUICK like. The Peanut Gallery Design Department gave the coziness a test run. Funny how you never have to ask this team for any help. They just GET it. And then Lake. Good to go guys? Awesome! 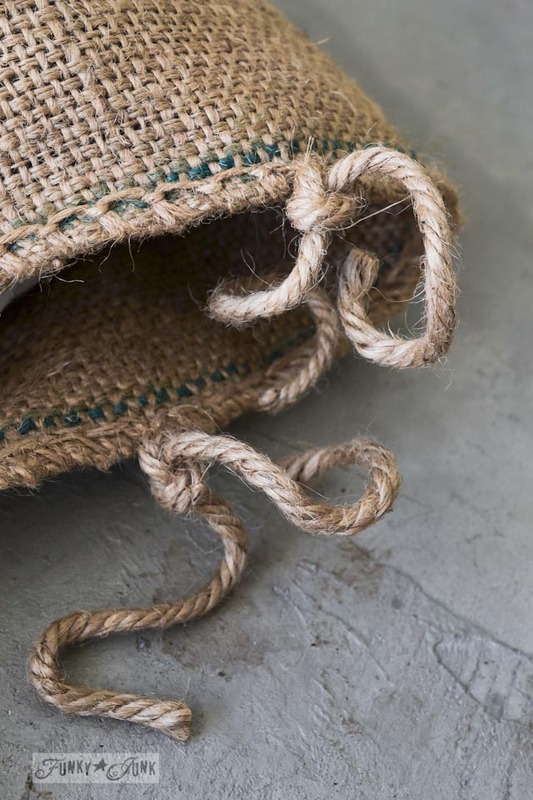 Just don’t crinkle the burlap, ok? Not until after the pics! 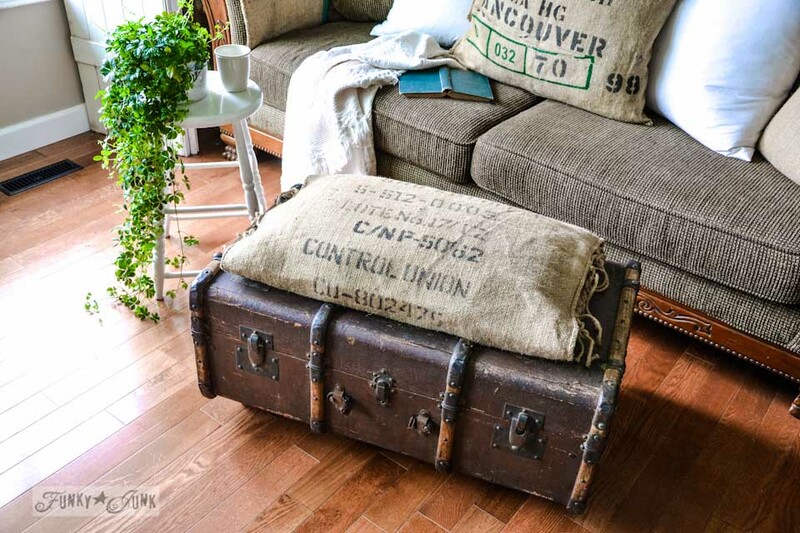 The funky old trunk and bean sack ottoman is cool! But it crinkled. Love how the surface can work as a coffee table or for your feet. And it’s actually wide enough for two people. 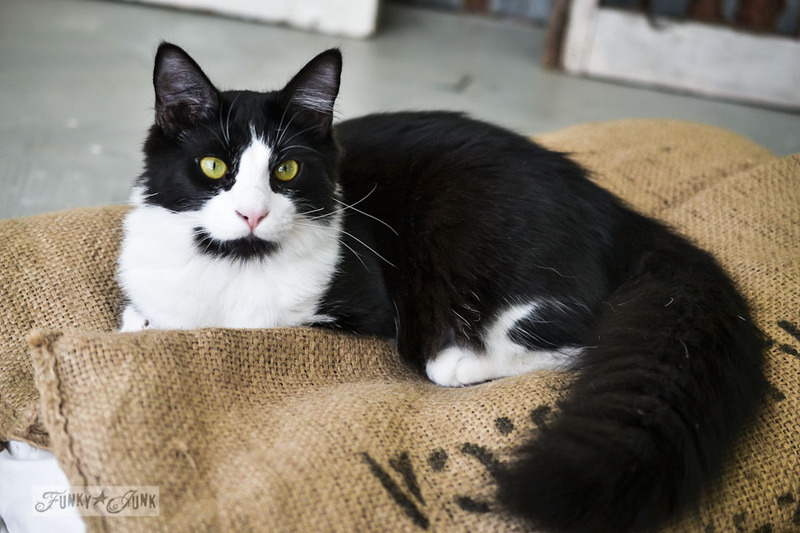 And two cats… crinkle #87, coming right up! I love how it looks! Very clever way to put on the casters! Adorable… and I like your assistant! Helpers, helpers, helpers. My cats are more academic, helping me on the computer, while reading or if I decide to write longhand. Aren’t we lucky to have such willing, cute help? I just had to chuckle because I remember you writing that you didn’t think you could handle getting another pet…once they enter our lives, even though their passing is AWFUL, we just miss their company too much. I can tell by your writing that you love animals too much to give up their company and, uh, their helpful ways. Love it! So easy to make, yet stunning in the finish! I love it that your cats knew just what to do with it. Love it! So functional – and vintage, too! 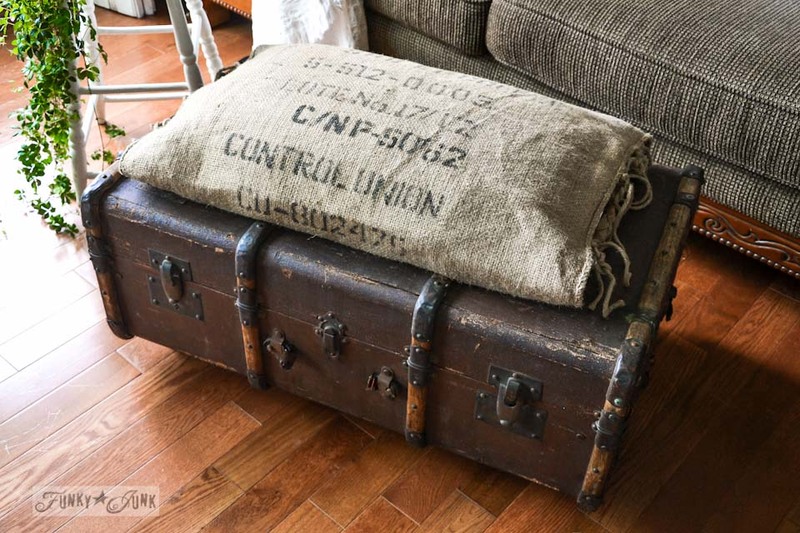 Just passed this on to my guy who recently moved and has a rustic looking trunk that’s just been getting shuffled around the room. It’s perfect for him since he doesn’t have a coffee table. Plus, I love the DIY wheels. However I think I’d opt for a different cushion. 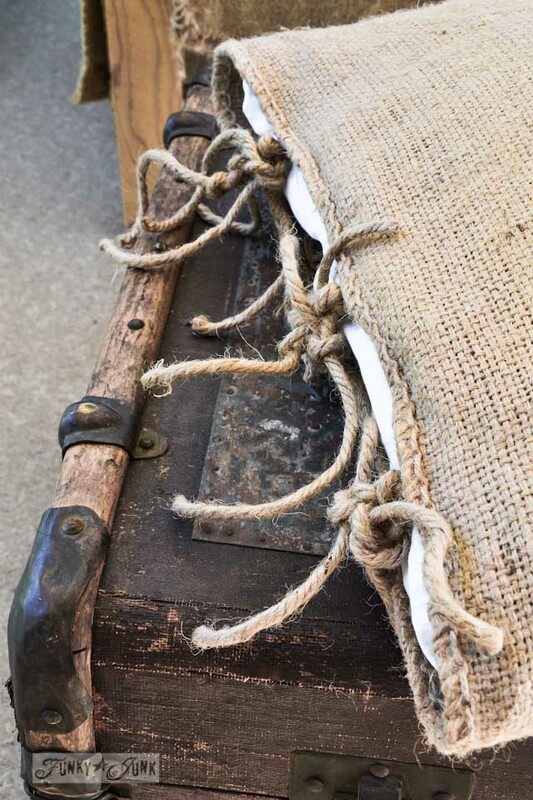 We bare foot in the house, and I think the burlap might be a little bit scratchy for me. That is awesome. How clever that was. Thanks for sharing. Can’t wait to see the next one. 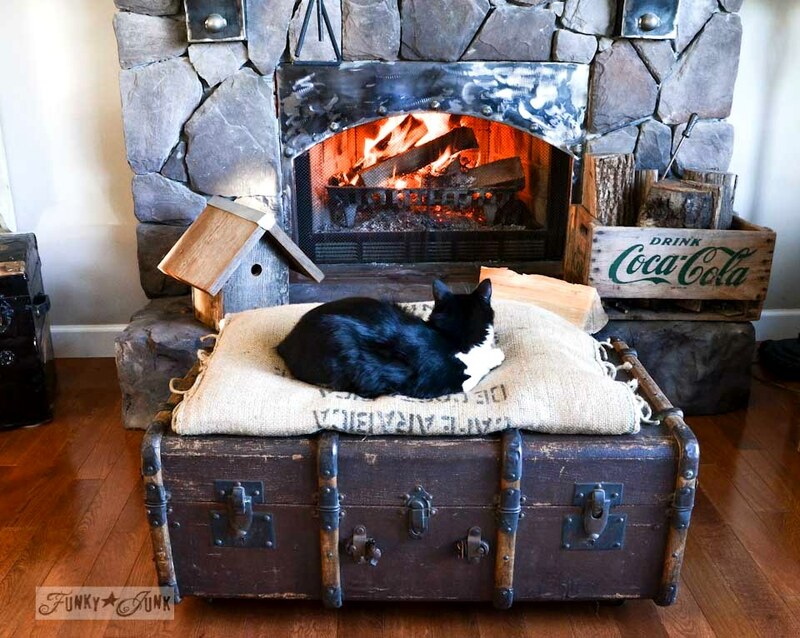 Very cute idea for an ottoman. Love the cats too! You are so awesome. You think of the neatest things. I love this! I love it, Donna….awesome work, as always! I just sooooo love this…..but I must be dense or something, what are the snaps for? lOL…..love that trunk!! 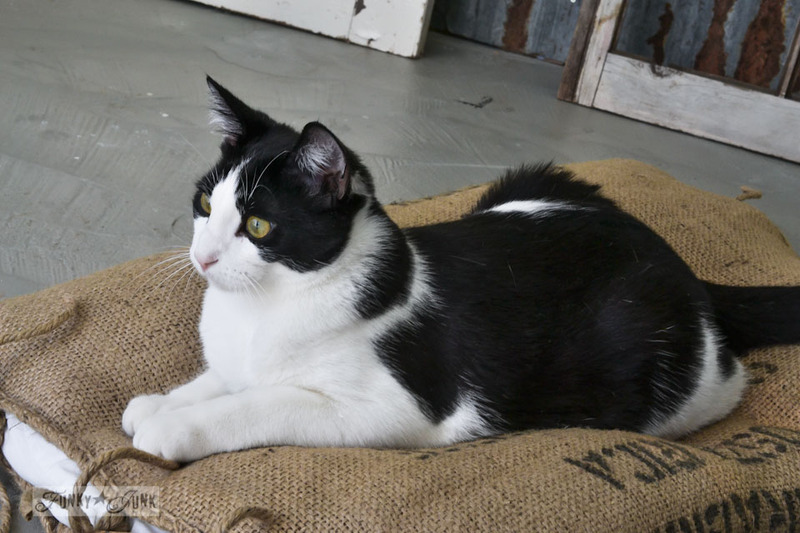 I like the bean sack ottoman. 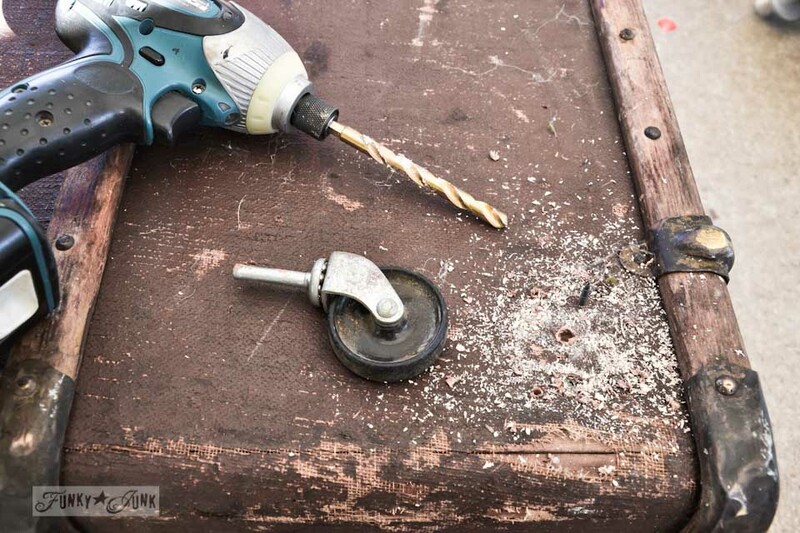 question 1.How do you secure the pins (that are on the wheels) to prevent them from coming loose, or are you only drilling small holes Question 2. 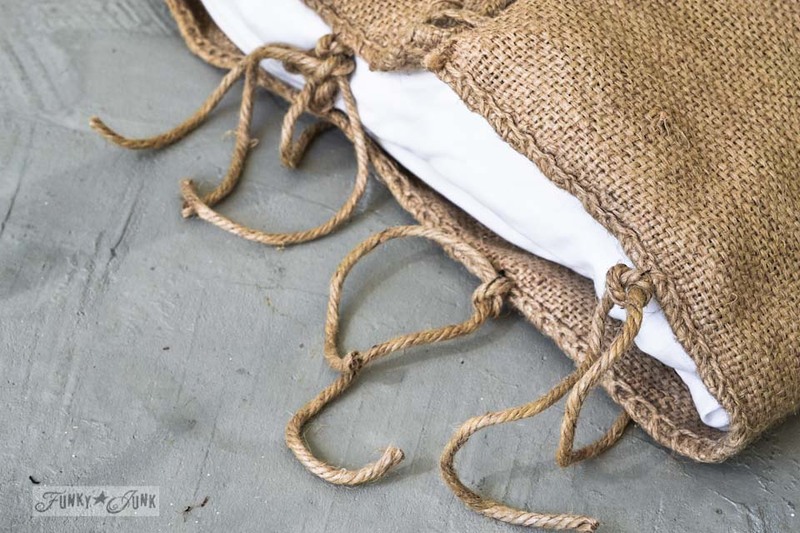 Is it safe to wash the burlap bags in the clothes washing machine, would washing the sack cause it to become soft/smooth ? BTW, this is my first time visiting your web site. 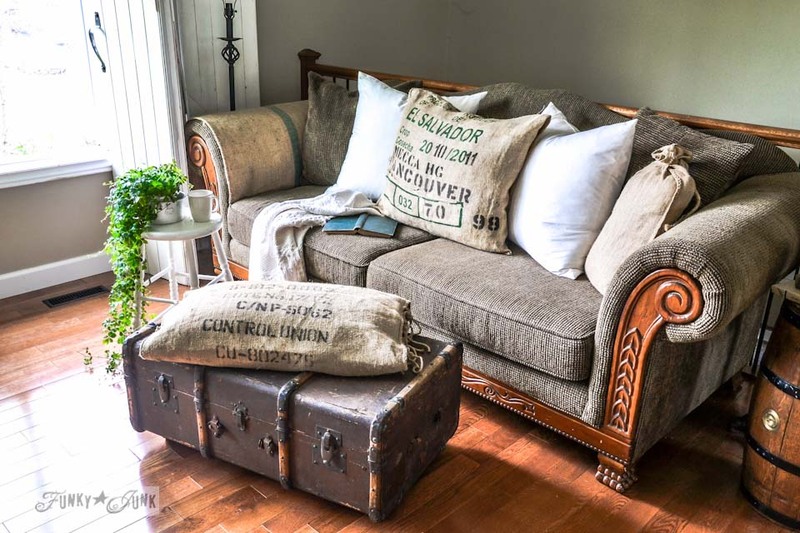 I found you on Face Book, and I love all the great ideas, naturally I have steered my home decor ideas in your direction, I think that all the things I’ve seen thus far to look cozy as all heck. Hey Lance! The holes were JUST big enough so the wheels slipped in. I did add masking tape to add traction to the stems so they didn’t fall out. I haven’t had good luck with washing burlap, but some have. And washing it apparently does make it feel softer to the touch. Hi, so sorry to ask, but I am a little confused and want to get this right! You said you flipped over trunk and added the 4 wood squares to the bottom . . . but the pics don’t show that. Then you said you removed the screw from the inside that you used to attach the wood square with. But how does the square stay attached to the inside? 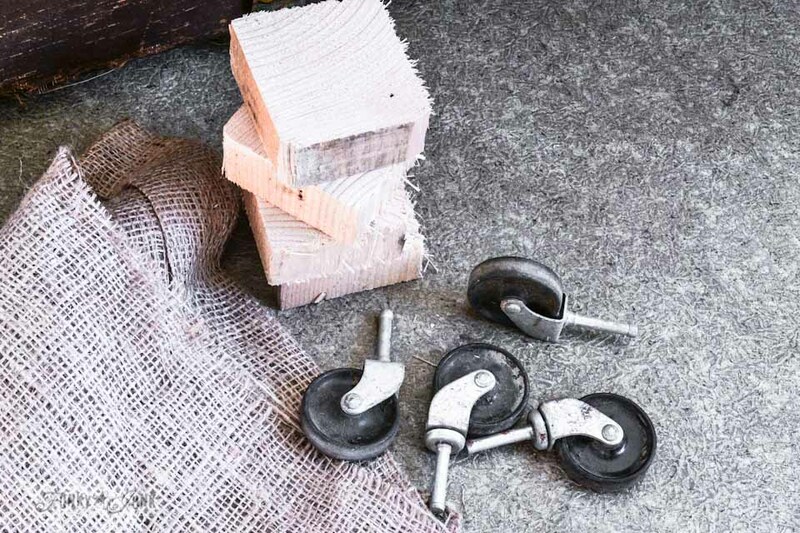 Did you screw more screws from the outside to keep the wood block in place? 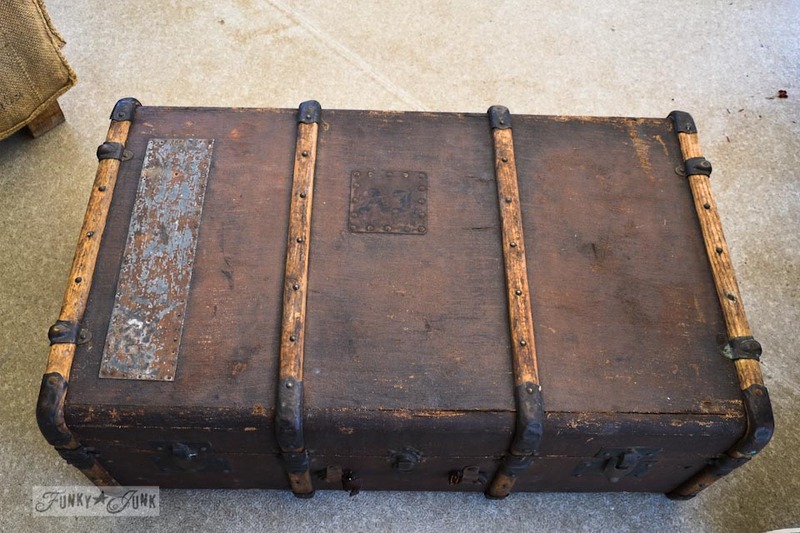 The four wood squares were added INSIDE the trunk with one screw from the inside keeping them in place.Then they were attached with screws from the outside. Then the interior screw was removed. I Love it, I’m a rustic and Primitive fan. I truly believe in using what you have on hand, a little imagination and you can create useful beautiful items for your home and garden, patio or porch. good work. I really enjoy your blog. That really turned out great. 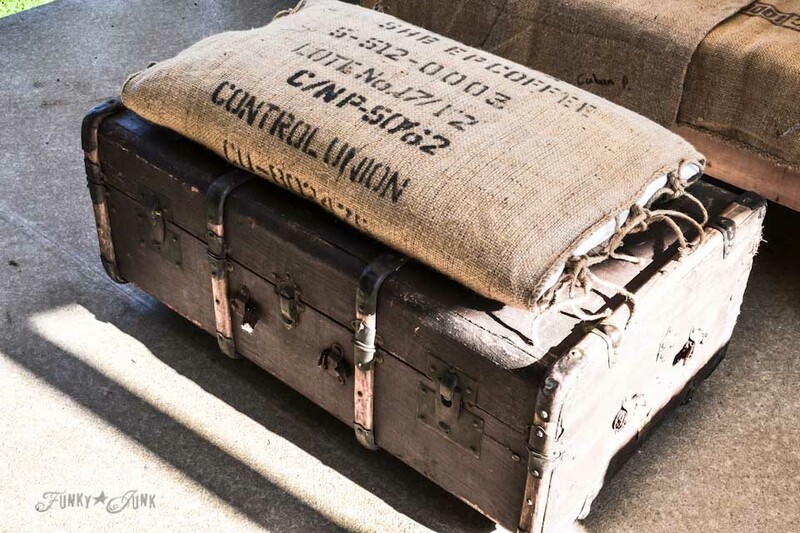 I love antiques and rustic pieces but haven’t done much refurbishing. Found an old wooden box with a hinged lid way back when I had a home-based marketing services business, painted my logo on the lid and put it on my front porch for pick-ups/deliveries from clients. A courier came to pick up documents while I was gone and took the whole box instead of just the envelope inside! Of course they brought it back … still makes me laugh. Love your site and the fun things you do! Very Nice! Love your couch, too. 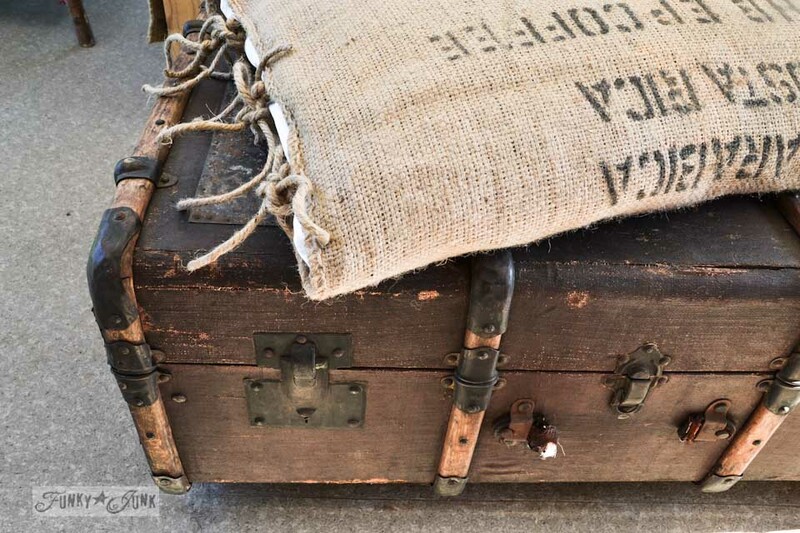 I actually have an old luggage very similar to this! And a grain sack, too!!! Perhaps I can make this to bring to my next market! P.S. I worked so much this week, I’m not well today. Using the time to catch up with the reading!! Thanks for all the help! I’m a complete idiot when it comes to this stuff so your tutorial was quite useful. I’m sad to admit this but I honestly didn’t know that I should drill the hole FIRST and then put the screw in and drill. DUH . . . so much easier instead of pushing pushing pushing the drill. Anyway I also didn’t do the 2×4’s on the inside of my box. MISTAKE! I’ll have to figure that bit out another day. My box is hella heavy so at least it can roll around now. Pics later.